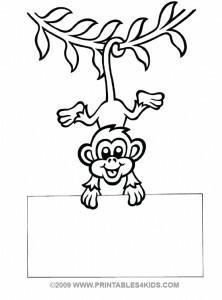 Have fun creating fun message cards, invitations or signs with this cute monkey hanging by his tail coloring page! Cut, color, and paste it on to colorful card stock or construction paper, glue on some artsy extras and this monkey will be a swinging hit! Click on the image above to view and print full size or download the Monkey Coloring Page with Message area as a PDF file. Check out our other monkey printables – Monkey Maze, Going Bananas Monkey Count and Coloring Sheet and Littlest Pet Shop coloring pages. Still need more monkey fun, Funkee Munkees is our sister site full of monkey games, party ideas, and monkey stuff.